Our deep concern about the environment brings us to think about agricultural production, and how we can work in order to produce safe food for safe health through beneficial agricultural practices. Dr Peter Swan, present in Beirut during a seminar on Maharishi Vedic Organic agriculture, focused on understanding how nature works and introducing the principles of organic agriculture, that aim to transform soil fertility shifting from chemical methods to biological ones. Step into the world of Maharishi’s Vedic Organic agriculture with Prestige. 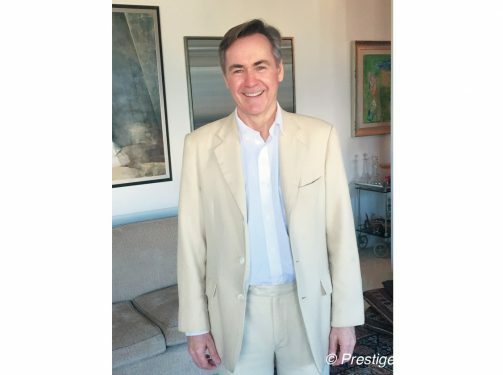 Dr Peter Swan, can you tell us the reason of your visit to Lebanon? I am in Lebanon to bring the knowledge of Vedic agriculture and Vedic gardening. Vedic agriculture means agriculture with Veda, which means knowledge. We have organic agriculture, which means agriculture without toxins, without poisons, but Vedic agriculture goes one step further, it adds knowledge. What knowledge is this? It is the knowledge of all the laws of nature, which structure health and evolution. We find this at the deepest level of nature’s functioning, the silent level of nature’s functioning where all the laws of nature are. It is called the unified field in modern science and the unified field is the home of all the laws of nature. We do our gardening in accordance with the laws of nature we know, you give water, you ensure enough sun, but all the laws of nature are actually involved in our gardening. For example the soil, the earth has many layers of its existence. On the surface we just see brown stuff, but inside it maybe 5% or 10% is organic matter, and this organic matter, part of it is non-living and part of it is living. The living part is mainly bacteria, fungi and many other organisms. All those organisms have evolved in the soil as the plants have evolved as well, they all evolve together. The plants and the organisms created the soil together over the past four hundred million years and the plants can’t live without the organisms and the organisms can’t live without the plants. What do you mean by organisms? Bacteria, fungi, moles, the whole environment evolved together. We grew up with the understanding that bacteria are bad. But only a small proportion of them cause disease, the rest are helpful or even essential for our health. The whole system needs to be in balance, and this is the laws of nature functioning at the level of the soil. We can enliven the totality of natural law that is responsible for evolution, we can do that through Transcendental Meditation. Transcendental Meditation means allowing the mind to settle down to quieter and quieter levels of activity until we completely go beyond any mental activity. Whatever the attention goes to it gets enlivened. We need to get nature in balance in us, in the soil, in the plants, everywhere. 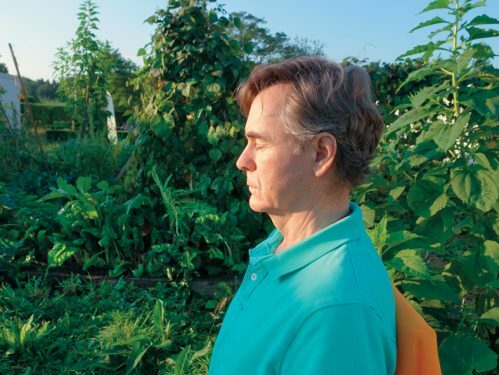 What is the link between Transcendental Meditation and agriculture? Agriculture is the basis of our health, and it is one of those areas which is not fulfilling its role in society, because it is giving us toxic and food with low nutrients, so agriculture has to be brought up. We like to grow our own vegetables because they are more tasty and more nutritious. How can I make my vegetables more nutritious? By using compost, which is the process of decomposition of natural organic matter, that process makes the nutrients available to the next generations, we humans take all the organic matter (dead plants or living plants) and we make them in heaps and decompose it in a specific way to produce the best fertilizer and bacteria for the soil. So it’s a natural fertilizer? Yes but not only, it is also an inoculation of bacteria and other microbes for the soil, because more than 90% of agricultural soils worldwide are degraded. Basically the organic matter has been lost, the organisms which evolved with the plants are reduced in number and variety. Compost restores those organisms to the soil, we make this compost and put it on the soil and restore the soil. How long does it take to produce compost? Depending on the system, it can take three weeks or 6 months -there’s hot composting and cool composting. Hot composting goes faster. What is the difference between hot compost and cool compost? In hot compost you take brown stuff, like brown leaves and straw, and then you take green stuff, green grass, green leaves and you pile it up, and you mix it. Then, because the green portion is high in nitrogen, it gets hot. Why? Because the bacteria digesting all this, they multiply, and their metabolism increases the heat in the heap. Then it decomposes very quickly, possibly in three weeks. In that process it can reach 72 degrees Celsius. At that temperature it kills the weed seeds and the pathogens. Now we have a fertilizer free of bad bacteria and full of good bacteria, we call it black gold, because it does everything good for the plants. What about cool compost? For cool compost, each day you put whatever you have on the heap. Each day you add a little more. It could be vegetable peels, it could be things from your garden, but because you add gradually it never gets hot, and it takes much longer because you don’t just make it, you just keep adding gradually, and then you take the ready compost from underneath. Most gardeners do it this way because it is not so easy to get the quantities of green leaves and brown leaves together at the same time and make the hot heap. You have to be well organized to do that. A good compost is dark brown and it provides the plants with food and immunity, because all the organisms which are growing under aerobic conditions, are the good organisms and they occupy the surface of the plant; the leaves, the roots, and then the pathogens cannot find a place, because the good organisms resist them. The organisms in the soil and in pure air are part of the immunity of the plant. When we meditate we enliven that fundamental value of natural law, not just inside me but in my surrounding as well, and therefore the plant also benefits. We have a microbiome in our skin, in our cells and they extend about 90 cm far out. Whatever we touch we leave them there, this has been going since the beginning of time. We are all sharing our microbiome all the time with the plants, with each other. When I meditate, I become in balance more and more and that extends even through the microbiome. Now the leading scientists are not talking just about the microbiome, which is in a specific area like in the gut, they are also talking about the omnibiome which means the whole thing, because you have your microbiome I have my microbiome, the house has its microbiome but the whole thing is one omnibiome, constantly interacting. When nobody is enlivening the fundamental value of natural law, then the whole thing is reducing down to the lowest common denominator which is dominated by the effects of industrial society, lots of toxins, lots of pollution. When we meditate we start to bring balance to that omnibiome. We have two layers to understand how the farmer meditating can improve his crop, one is on the level of natural law itself and another is on the level of the omnibiome, the organisms. What is Vedic gardening? Vedic gardening means that the activityof the gardener should be in accord with natural law. What does that mean? It means whatever the gardener is doing, it does not violate natural law, does not cause damage in his garden. What I teach in the seminar is mainly how to garden by doing less and have better qualityof crops, plants. For example, it is possible now to garden without digging at all, and to have no weeds, it’s called No-dig gardening. Is it becoming very widespread? I can give you the name of an English market gardener, Charles Dowding. He grows for the market- salads, vegetables- he has been practicing No-dig gardening for more than thirty years, and his crops are beautiful. If you dig, it’s very damaging for the soil structure (and tiring for the gardener!). Soil is not sand, soil is sand plus silt plus clay plus organic matter. Part of the organic matter is non-living and part of it is living. All of this gets built up into soil by the living organisms, that stick together, the tiniest particles of soil, and make a structure in the soil. And that structure allows for the air to move through, for the soil to breathe, and it allows for the water to move through. When you dig you smash that structure and the soil is not able to breathe, it gets compacted. It’s possible to garden without digging and to farm without ploughing. Both of them are the main things responsible for the degradation of the soil worldwide. These farmers and gardeners spent thirty years without disturbing the soil and they get the same yields as with chemical farming, and even higher quantities in dry years because they didn’t destroy the soil, and the soil brings moisture up from underneath. They get better quality crops, they get the same or better quantity and they do it with much less work. Planting without digging or ploughing improves the soil every year. Who can resist this? What is the alternative if compost is not available? It is gold standard to have some compost but that is not always essential. Let me give you the example of a pumpkin farmer in Pennsylvania. 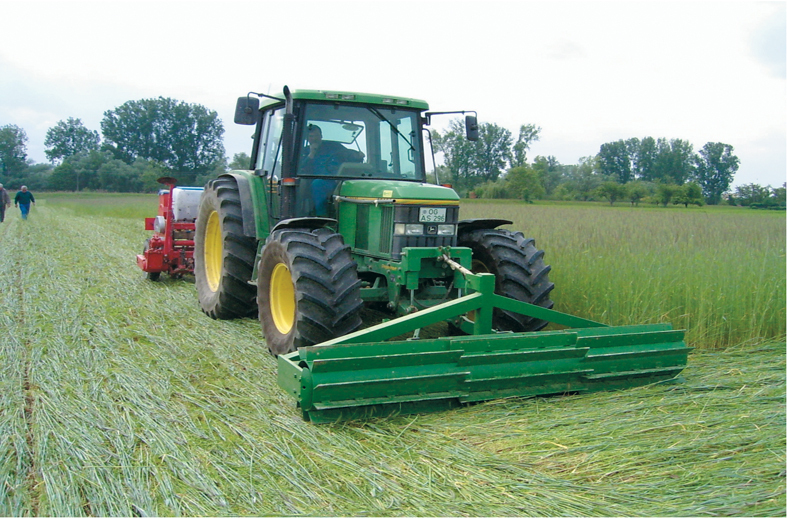 In the autumn he sows a cover crop of rye and vetch, using a direct seeder that does not disturb the soil. 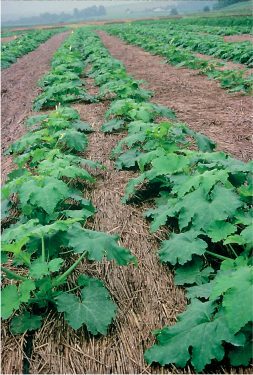 When his field of rye and vetch comes up in spring, he rolls it flat and it becomes mulch, lying on the surface of the field, this mulch prevents weeds from growing, nourishes bacteria and prevents the evaporation of moisture from the soil. He is using a direct seeder that puts the seed into the soil without disturbing it. It has metal disks like a pizza knife that cut through the remains of the previous crop and into the soil, just a thin cut, and then behind that comes a pipe that drops the seeds into that slit. And the wheels at the back close it. And because the mulch preserves the moisture the farmer never needs to irrigate – heaven on earth! This man is not a meditator but his agriculture is very much in tune with natural law because his soil is improving every year. He has scientists from universities who come and research it and they find that his soil is better in every way year by year. When I visited him eight years ago, he had never ploughed his field for 25 years, and it’s even cheaper because he does less work. What is the benefit of Vedic Agriculture for the environment? We have the solutions available to have pure agriculture, which produces pure food, and heals the soil at the same time. The other interesting thing is that we heal the soil by returning the organic matter to the soil. That organic matter is 95% carbon, once returned to the soil, it would reduce the excess carbon in the atmosphere and heal global warming. Most of the carbon in the atmosphere did not come from industry or motorcars, it came from agricultural lands, and the amount of excess carbon in the atmosphere has increased at the same rate as we have lost the carbon from our soil, year by year, for the last 100 years. So if we would change and do this kind of agriculture, and there are many ways which return the carbon to the soil, which requires much less work, which produce non-toxic crop, then we could have a completely healthy world. It only requires the consciousness of the farmer to change. Dr Peter Swan how did you come to Vedic agriculture? I studied at university psychology and literature. I grew up in South Africa where my father was a farmer. It was clear to me that no farmer knew what he was doing, they were all trying this and that. This was not good for the environment and could not continue, because often it was violating natural law. Through my studies of Vedic science, I taught for thirty years Transcendental Meditation and practiced Ayurveda. The leading Vaidyas (Ayuvedic doctors) of India worked together with Maharishi to revive Ayurveda in all its value. The knowledge of Veda is ancient but we use the modern research- all this understanding of bacteria is modern. We use modern research to understand better. Ayurveda is based mainly on diet so then again I went back to agriculture because what you eat should be according to the laws of nature. What grows in each area is the best for people in that area. I was practicing Ayurveda in South Africa and I started to look at the indigenous food. Maharishi Mahesh Yogi asked me to work in agriculture, set up farms and run them in different continents. Once we had a project on a farm in Ukraine, we noticed the earth was like concrete, after 60 years of farming with chemicals, and big tractors. There was not much water or organic matter left in the soil. We had to do a lot to break up the soil and plough it, so when we asked Maharishi how to solve this problem, he said: «Farming is just putting the seed in the soil and watch it grow…». I was forced by my situation setting out farms with organic agriculture to find out all the latest research on how the plants get their food and how the farming can be done, with less work and in a way that improves the soil. I worked with leading farmers in Europe, in America, in India, in Africa, in Australia and I found out the very best of what they have found and put it together. It is a long work, how many years did it take? I worked about fifteen years in agriculture, and now I am teaching agriculture.